Interview is reprinted from Newsletter No 5 of the East-West Cultural Center, Los Angeles, CA. Number 5 Rue Dumas is on the street in French Pondicherry directly behind the main compound of the Sri Aurobindo Ashram; Golconde is just a block down the street from this large French Colonial-style structure that the Mother had named “Fenetres” (windows). This is home to Udar Pinto, his English wife Mona, manager extraordinaire of Golconde and their daughter Gauri, a teacher in the Higher Course at the Sri Aurobindo International Center of Education. Sri Aurobindo gave Udar (Generous) and Gauri (another name for Durga meaning the Fair One or Golden One) their names but asked that Mona keep her own name as it reminded him of the Mona Lisa. At “Fenetres” one enters into a glorious courtyard ablaze with vibrant colors of bougainvillaea, marigolds, roses, other types of flowering plants, graceful arrangements of potted plants and an upstairs terrace filled with orchids. Gauri’s animals (she rescues cats and dogs from the streets of Pondicherry and nurses them back to health) either playfully greet one at the door or in the case of some dogs stand back and snarl and growl suspiciously until one’s intent for visiting is cleared to their canine satisfaction. 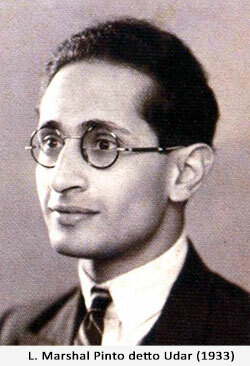 Udar told me that he was born in Hubli in Karnataka (near Goa) in April of 1907. His father was a businessman there and did many things for the town of Hubli. The road they lived on was called Pinto Road. His father had originally come from Goa. Goa was colonized by the Portuguese and long back Udar’s family had taken on a Portuguese name of Pinto and had completely lost all contact with their original Indian name. He studied at the Good School in Goa and was brought up in the Catholic Church. He said he was a good Catholic and took his religion seriously as a young man. Later he began to find some rather foolish things in all religions which is what ultimately led him to Sri Aurobindo. He passed his exams in Hubli and was sent to Mussoorie in the mountains of North India for further study. He wanted to take a degree in engineering and was being prepared for that goal. However, by that time he had become rather unruly and was thrown out of school. This was to be a turning point in his life. He stated that if he had remained there he would have graduated, gotten a good job and settled down to a “humdrum” life. After he was thrown out he attended another school in Belgaum and from there went on to Bombay to the Royal Institute of Science for a degree in engineering. He was then sent to England in 1929 where he spent four years and earned a degree in Aeronautical Engineering from London University. However, there was nothing for him to do. There were no airplanes in India at that time so he had to go into business. He settled down in Pondicherry in 1935 because it had a reputation for being a good place to do business. He tried it out for two years and it proved to be prosperous. All of his friends were connected with the ashram but at that time he was not interested nor did he ever visit the ashram. He was a young man and a bon vivant. His friends came to his home for sumptuous dinners and whisky and sodas and “all kinds of things”, he said. They would go back and tell the Mother stories of their visits to Pinto’s house. She would say “that Pinto fellow is spoiling my children and I will catch him one day”. “Finally, She did”, Udar said. Udar had met his beloved Mona while attending school in England and she waited 3 years for him while he got settled in Pondicherry. Finally in 1937 he sent for her and they were married. Their daughter, Gauri, was born at the end of that year in November. After Mona and Udar were married somebody suggested that they should have darshan of Sri Aurobindo and the Mother so Udar arranged for this. “There were very few people in the ashram in those days so there was no long cue,” Udar said. In August of 1937 they had their first darshan. This is how Udar described that moment: “When I saw Sri Aurobindo for the first time I got a shock. I had seen kings and emperors in Europe, England and Asia whose clothes were majestic but the person inside quite ordinary. Here was a man wearing only a dhoti and chaddur (shawl) sitting bare-chested and looking like a king. I said to myself “at last I have seen royalty and majesty”. “After that darshan we were very much drawn to the ashram”. The war began and Sri Aurobindo and the Mother took a keen interest in it. 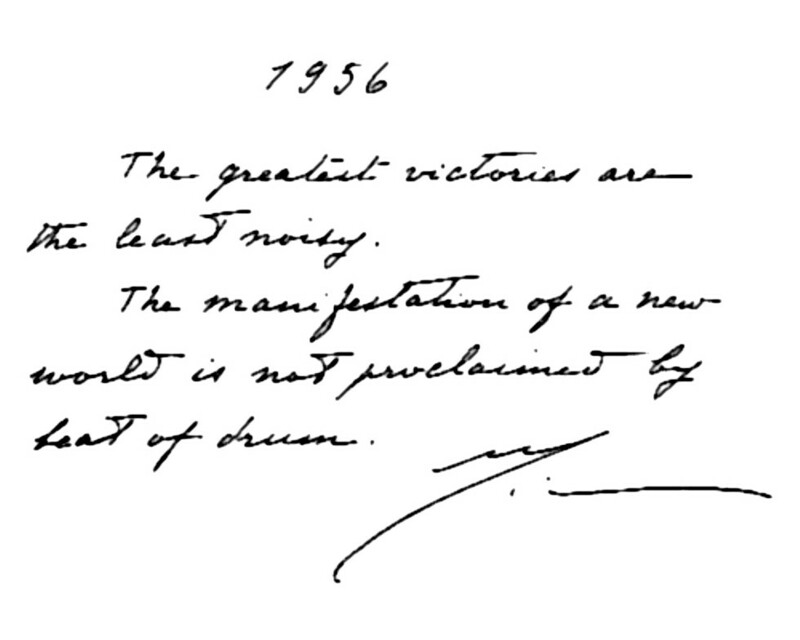 “All wars”, said Sri Aurobindo, “are begun by the asura”. The Second World War was an effort by the asura to destroy the work of Sri Aurobindo and the Mother for the earth’s evolution toward the Supramental Light. Sri Aurobindo began to work occultly behind the scenes for the war effort even finding an opening to His Force in Sir Winston Churchill. Udar said there were very few radio sets in Pondicherry at that time and no radio broadcasting. Udar owned a radio set with sophisticated aerials and other equipment so he was able to tune into BBC in order to receive news of the war. Pavitra (the Frenchman whose European name was P.B. Saint- Hilaire) and Pavita use to come to Udar’s house every night at 9:30 to take down the news in short hand and type and prepare it to send to Sri Aurobindo the same night. Udar offered the radio set to the Mother but she refused it by saying She had “enough of ulcers”! Later on when the war situation escalated they finally installed a radio set in the ashram. Udar had begun to become more and more drawn to the ashram. By then the Government of India had started a Civil Aviation department and they knew of his degree in Aeronautical engineering so they asked him to come and work for them. He did not want to go as he and his family were quite happy in the ashram. 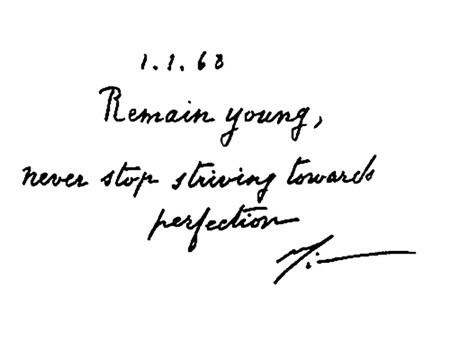 Sri Aurobindo, however, told him that he MUST do it. He wanted his children to work for the war effort. Sri Aurobindo told him this was not a war between the nations and people but a war between the Divine Forces and the forces of the asura. He took his family out of Pondicherry and worked for the government successfully for one year and was happy in New Delhi and so was Mona. Little Gauri, however, at 3 years of age very much missed the Mother. After one year he took a brief leave and brought them back to Pondicherry. Sri Aurobindo then told him that he had done enough and that he could return to the ashram to stay. He went back to New Delhi, gave a month’s notice and returned to the ashram where he has lived since. The Nizam of Hyderabad through his Dewan, Sir Akbar Hydari, had given a sum of money to the Mother as She, at one time, had spoken to him of wanting to build a residential building on some property the ashram owned. Since the money for the building had come from Hyderabad the Mother decided to give it a name associated with that state. She named it “Golconde”, the French form of Golconda, after the famous fort and diamond mines in Hyderabad. Antonin Raymond, a well-known Czechoslovakian architect and friend of Pavitra, came to the ashram for a visit and eventually took on the project. Working with him on the Golconde project were the Japanese-American architect, George Nakashima and another Czechoslovakian architect by the name of Francichech Sammer. The building work had already begun by 1937 when Mona and Udar joined the ashram but they were both associated with it from that time. The Mother put Mona in charge of Golconde before it was finished and gave her a room in which to work, to prepare the linens and train the young ashram ladies who were to work with her. She taught them to speak English as well. The Mother also gave Udar a small shed for his work. She called it Harpagon. Harpagon is the name of the miser in Moliere’s play L’Avare (the Miser). She said that the land had belonged to a very wealthy man and that he could have given the land freely. Instead he doubled the price! At first the Mother said no, but then She decided to buy the land and name it for the miser. Ironically Udar’s name means “generosity”. Udar said there was so much work to be done. Large amounts of money were needed for the completion of the Golconde structure. There were things to be manufactured; some brass fittings were needed and machines were needed for manufacturing these parts to precision. Udar had no money as he had given all his money to the Mother. He needed at least 2 lakhs and asked the Mother for this amount. The Mother gave him 1 rupee to start! At first he thought She was making a joke then he realized that if She had given him the 2 lakhs it would be the 2 lakhs that would have actually done the work. He said “by giving only 1 rupee it was therefore I who had to do it”. He took up the challenge and worked very hard and happily and slowly until the job was done. Of course today Golconde and Harpagon are cherished units in the ashram. Golconde is one of the most beautiful and unique buildings in the world with its teak furniture, Japanese-style black stone floors, walls of crushed seashells, giant cement/louvered shutters and of course its lovely monastic peacefulness. Udar went on to develop Harpagon’s many industries including furniture making and stainless steel products. 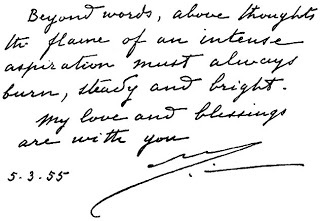 ANIE: Can you describe Sri Aurobindo’s voice and any other impressions you remember of Sri Aurobindo? UDAR: Sri Aurobindo’s voice was a beautiful, well modulated sound. If you did not see him you would think that you were listening to a Cambridge-educated Englishman speaking. Sri Aurobindo just sat there looking as though He were gazing out into eternity in His great lonely days of descent into mortal life in order to help humanity. (Udar chose not to personalize other impressions of Sri Aurobindo but instead he quoted a passage from SAVITRI, Book III, “The Book of the Divine Mother”, Canto IV,”The Vision and the Boon”. Udar said Sri Aurobindo was writing about King Aswapaty in that passage and speaks in the third person, but is actually writing about Himself). ANIE: Can you describe what it was like when Sri Aurobindo left His body? UDAR: I was in His room next to Him when he died. I was handling the oxygen tank and then He went into a coma. I knew all the medical aspects of what it was like to be in a coma. However, in the case of Sri Aurobindo it was altogether a conscious coma. No ordinary person talks in a coma. At one point He asked in a firm and clear voice: “Nirod, what is the time”? Nirodbaran looked shocked.”Sir, It’s 1 o’clock” Nirod said. 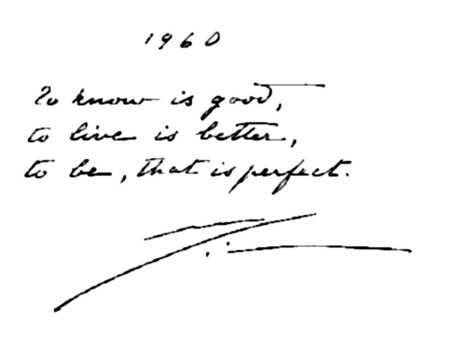 Sri Aurobindo said “I see” in a clear voice and then returned to the coma. Champaklal was massaging His feet. His breathing became slower and slower and then there was the last breath which I recognized. Dr. Sanyal asked me to turn off the oxygen tank and I went back and stood in the back of the room. I was quite calm and interested to see all that was happening. The Mother had no look of sorrow on Her face at all. Neither did I feel sorrow for I knew that Sri Aurobindo had left His body consciously. In SAVITRI, the Book of Death is very short. When Sri Aurobindo was asked about this he said “You cannot expect to write about something you have never consciously experienced.” So, He experienced death consciously and will return to complete the Book of Death. Dr Sanyal said “Mother, everyone is in shock except for Udar”. The Mother put me in charge of everything. She looked at me and said “Udar take charge of everything and come to me for instructions” and then She left the room. “To Thee who hast been the Material Envelope of our Master, to Thee our infinite gratitude. Before Thee who hast done so much for us, Who hast worked, struggled, Suffered , hoped, endured so much, before Thee who hast willed all, attempted all, prepared, achieved all for us, before Thee we bow down and implore that we may never forget, even for a Moment, all we owe to Thee.” – The Mother, 9 Dec. 1950. After the Mother died I opened up the top room. I took the clean river sand that had been lying over Sri Aurobindo’s tomb from 1950 to 1973 and kept it in barrels. I made packets from the sand and gave them out to many people and it helped them in sickness and pain and in times of trouble. ANIE: What changes do you see taking place in the Ashram in the future and will it be different in any way from what it is now? UDAR: There have to be changes. We live in a changing world. The changes in the Ashram since the Mother’s passing have not always been as good as they could be. Many people have not worked closely with the Mother nor even seen Her physically. So, in many cases there is very little knowledge of the Mother’s way. Many people try to do things in their own way, to do what they think best and not always necessarily in keeping with what would have been the Mother’s way. I always speak about the Mother to everyone but many go on preferring their own way. 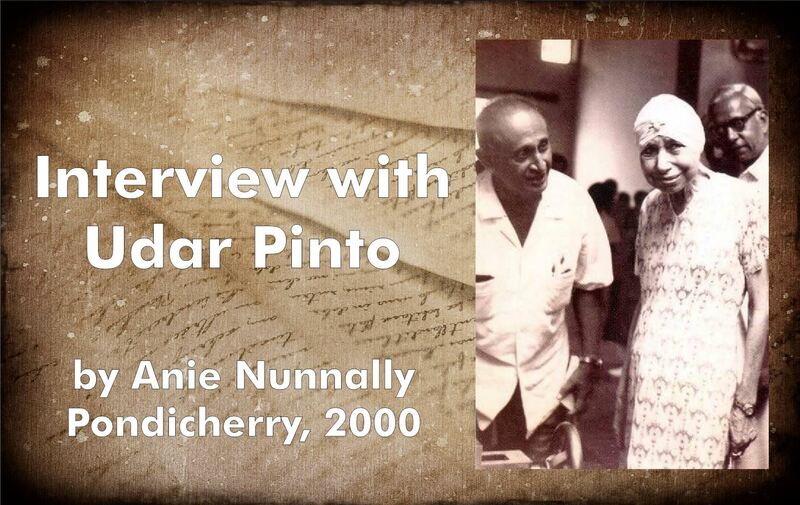 ANIE: What can you tell us of the Auroville project? UDAR: Auroville was built as a city for the Divine to give a message to the world. The Mother told me to inaugurate Auroville. The Mother called in representatives from all the nations of the world and assigned to me the job of Master of Ceremonies. The Charter was read out in English. I announced each nation and while two young people from each nation placed soil from their country into the lotus urn there was an interpreter reading the charter in the language of that particular nation. It all went so beautifully and was never rehearsed. 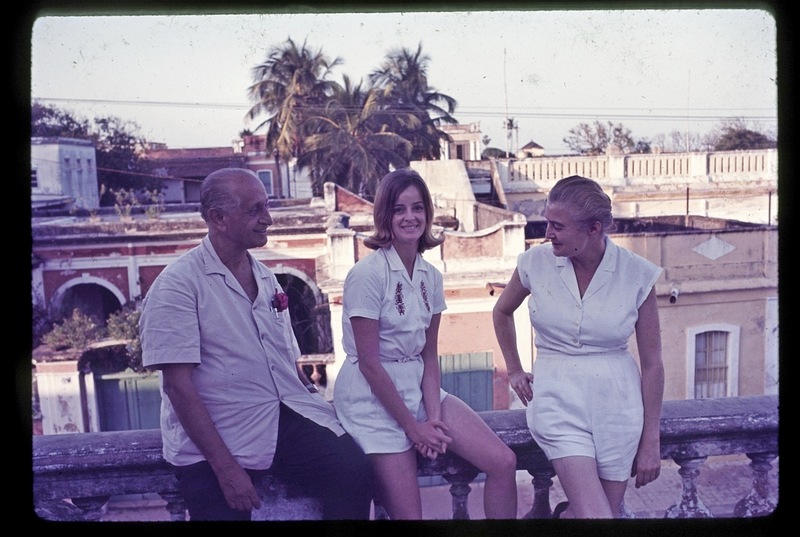 The Mother said Auroville did not need to follow the divine life of the ashram. She said they were to concentrate on building a new city for the Divine in their own way. So, the ways of Auroville are different from those of the ashram and Aurovilians are not expected to follow the ashram way of living. ANIE: What advice would you give to new spiritual aspirants that would help them in their development and help them to integrate their lives in the world with its focus on materialism and the vital life? UDAR: The word “spiritual” is often used in a loose manner. Generally people take it to mean a higher mind and life in an elementary way but not necessarily a “spiritual” way. Spiritual means the way of the spirit and nothing else. Very few people know what their spirit is. They know they have a soul but how it operates they do not know. It is only when one becomes conscious of the soul through sincere yogic discipline that one can become a true servant and instrument of the Divine. ANIE: It seems that fewer young people are drawn to the yoga in America in these times. What more can we do to inspire interest in Sri Aurobindo and the Mother in the youth of our culture? UDAR: One must keep a door open for those who want to come, but we are not here to proselytize and get disciples. If they come it is by their own choice and what they do with it is up to themselves. ANIE: What do you see as the strongest attributes of Americans and their contributions to the yoga? UDAR: The Americans who have come to the ashram are highly evolved people and their presence is a gift to the ashram. Many Americans in the archives department are wonderful men and women and have progressed very much inwardly and have contributed in many ways to the work and are of great value to the ashram. I have a very good feeling about the Americans in the ashram. ANIE: What were some of your experiences and impressions of North America when you visited in 1972? UDAR: In 1972 the Government of India asked the Mother to select two people to give talks on Sri Aurobindo in connection with His Birth Centenary year; one to go to the East and one to go to the West. Sisir Kumar Ghosh was chosen to go to Japan and other Eastern countries and the Mother chose me to go to the West. I asked the Mother “Why me”? “I am not a speaker on philosophy”. Then Mother said ” I have chosen you, so you must go”! The Mother said She would speak through me and that I did not need to worry that at all times She would remain very close to me. This was so in every instance. When I reached America they began to call me “Swami-ji”. I looked to see if there was anyone else around! 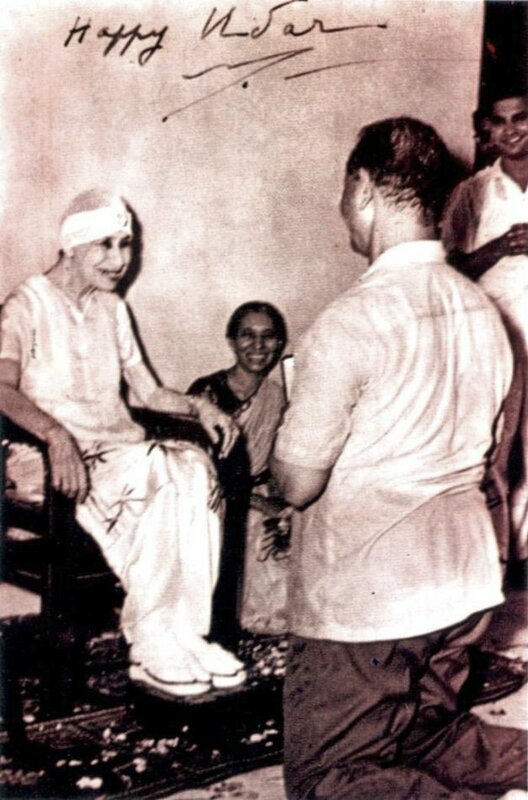 I told them ” I am not a Swami, I am just an ordinary person whom Mother has sent to speak on Sri Aurobindo” When I later returned to the ashram the Mother said “They called you Swami-ji there”? I replied “Yes, Mother”. The Mother said “I knew everything that happened to you in America”. “I was with you all the time and I am glad you did not accept the title of Swami-ji. If for any reason you should ever fall into that trap, I will come and break your head”! I had a wonderful trip to America. I found the people generous and warm. We were often treated as guests at restaurants, people helped us freely on the road when our van broke down. In private homes we were received with gracious hospitality. While I was visiting America there was a 3-day seminar at Cornell University – an inter-religious conference. Leaders of all the world religions were invited. My hosts tried to get me on the program but it was declined because the conference had been planned two years prior. However, they said I could come and participate in the discussions so I agreed. Suddenly I received a call from them that the main speaker had fallen ill and could I come and replace him? I said “yes”. 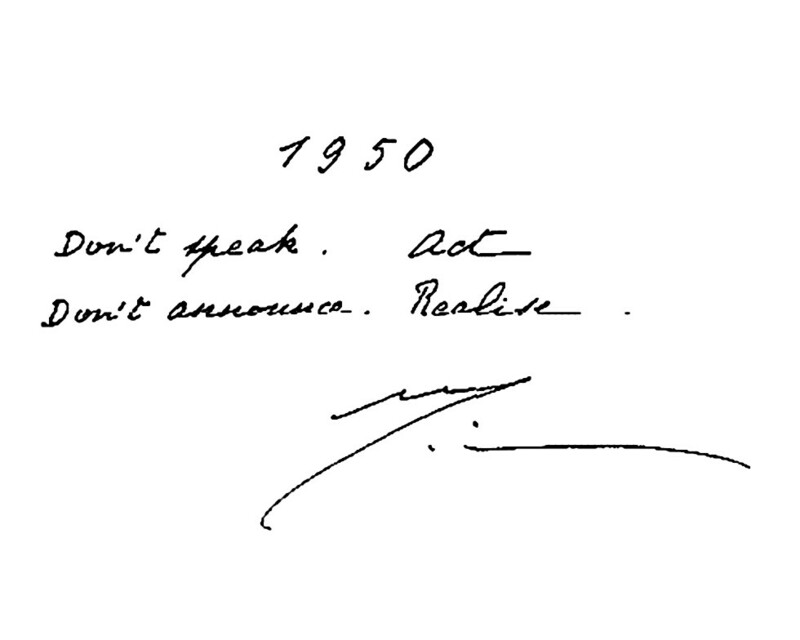 They asked me to send a speech but I wrote that I only spoke extemporaneously. This was accepted and all throughout I felt Mother’s Presence and Help, even saw Her face before me. The Mother had told me before I left India “You have only to call me and I will be with you at once, at every moment I will be with you”. ANIE: Can you share some of the advice that the Mother gave to you for your own personal sadhana? UDAR: One day I asked Mother. “I have been doing the yoga for many years but I am not absolutely certain how to do the yoga of Sri Aurobindo. I read all the books and try to do the yoga but I am not certain how far I have progressed”. I asked the Mother to help me. “You are doing it all wrong”, She said. I said “What shall I do”? She said, “I will do the yoga for you”. I was thrilled! “What do I have to do”? I said. “Give yourself over to Me and I will do it for you”. Udar said “How do I surrender”? She said to me “Do you sincerely want to”? I said “Yes, certainly Mother”. Mother said “When you get up in the morning what is the first thing you do”? “I brush my teeth and as a matter of course I am thinking of all kinds of things and not at all consciously”, I said. Mother said “Try and think of Me while you are brushing your teeth. Talk to Me keeping fully conscious while you wash your face and brush your teeth. When you eat that is the time you must be very conscious of Me. Feel that I am eating with you and talk to Me and enjoy your food. Let all the parts of your being remain conscious of Me. Eat every mouthful with Me and you will find that things taste so much better when you enjoy the food with Me. When you go to sleep that is the time when you should be very conscious of Me. Let Me put you to sleep and then the whole night you will have a conscious sleep. When you awaken and begin your day you will then begin it in a more conscious way”. Since that conversation I have sincerely tried to make this effort. It may not always be complete and whole but I make the effort to remain fully conscious of the Mother’s Presence in all my actions and activities. ANIE: How is the sadhana different for you at this stage in your life; what new forms, if any, has it taken? UDAR: At this stage of my life I just want to be always conscious of the Mother’s Presence in me. I am always calling Her and She never refuses to come. If I ask Her for anything She gives it to me if it is useful for my sadhana. If not, then I know it is not and accept that. I have no regrets about anything at all. I am very happy to have served the Mother consciously and I want to be like that up to the end. If there is an end! The Mother told me not to accept death as inevitable She said “Don’t say you are not going to die, but don’t say you have to die” When it comes face it in full confidence of my support but fight it”! “Do not accept death”! Udar remained silent for a few moments and then began to chant Mother’s mantra “Om Namo Bhagavate” and then “Om Anandamayi”. I sat quietly with him for some time and then left him in the atmosphere of that still, quiet space. A few days later I returned to see him. It was December 17th, the day before my birthday, and Udar had developed a bronchial condition. I felt he was too weak for the interview and I did not want to tire him. However, he called me in to present me with flowers and beautifully wrapped birthday gifts. 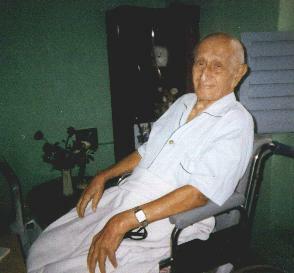 Udar had been my liaison to the Mother, delivering my numerous chits and letters to Her during my years in the ashram and prior to the time that I went there to live for 3 1/2 years. He had been privy to all my innermost questions and concerns that were put before the Mother. He advised and counseled and inspired me as well with his great strength, wisdom and positive outlook. What a fitting name…Udar…for he is truly generous with his time, help, work, friendship and most of all the largesse of his inner being and spirit. He was always wearing his ever-present red rose given to him by the Mother and for years after Her passing he continued to wear a red rose. Udar was ill with bronchitis for most of the remainder of my stay in Pondicherry. I saw him one last time before my departure with a group of French visitors who had come to see him. He was in good humor that day and had us laughing heartily. About losing his voice to bronchitis he said: “In my household it did not make much difference as the women do most of the talking anyway”! He said “Did you know that generally speaking, women are generally speaking”? After all the time that I spent with Amal Kiran and Udar Pinto I reflected on these two souls who, with their very divergent backgrounds; one a scholar and writer and the other an engineer and businessman, had come to the Mother and Sri Aurobindo as young men and in a common bond had devoted their lives to the service of the Divine and to the Yoga of the Supramental. At this stage in their lives both have focussed their priorities on remaining open to the Divine Light of the Mother and Sri Aurobindo for as long as they are in their present bodies. I could not have been more deeply touched nor blest to have been in their inspiring presence.